Happy New Year!!! We have sold out of all of our in-stock handles, and are busy making custom orders presently. 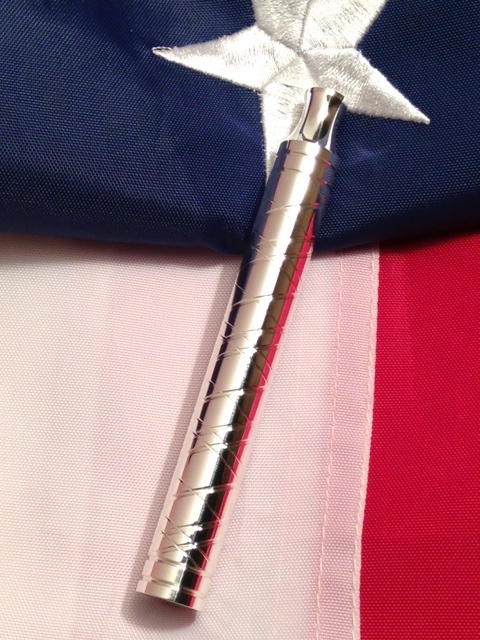 Among the custom orders is this Sterling Silver "Plaid" Handle. Mr. Lucero did a great job on it! It is 4.15" long and weighs 4.6 oz. It is beautiful! Because silver is the most reflective metal on earth, it is hard to see the details. The picture doesn't do it justice. While this one is already sold, we can always order more silver rod from overseas and make another sterling silver handle for you. You can even choose your own design (within reason and capability). Price: $300.00. I haven't been on the site much so this is the first I've seen of your stuff but you've made the king cobra just as beautiful as the classic, this thing looks great! (01-02-2015, 05:46 PM)ShaneN. Wrote: I haven't been on the site much so this is the first I've seen of your stuff but you've made the king cobra just as beautiful as the classic, this thing looks great! Thanks! That's saying a lot because the Classic is simple and beautiful. The stainless steel King Cobra handle has been sold and is getting a diamond pattern added to it per the customer's request. I'll post pictures once the diamond pattern has been added. The sterling silver King Cobra handle was sold with its smooth yet luxurious simplicity.